The tungsten carbide burrs with innovative ALLROUND cut help to save both money and time thanks to their extremely high stock removal rate on key materials. 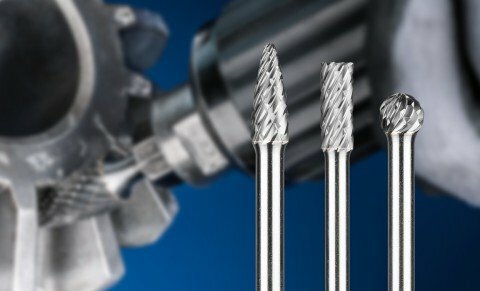 PFERD burrs with ALLROUND cut are a unique type of milling tool. They can be used for a variety of applications on key materials such as steel and cast steel, stainless steel (INOX), non-ferrous metals and cast iron. Their stock removal rate on steel is up to 30% higher than with conventional cross cut burrs. Applications range from milling out, smoothing and deburring right through to the creation of apertures, surface work and work on weld seams. The ALLROUND cut permits pleasant working with less vibration and noise. Significantly higher stock removal rate than with conventional cross cut burrs. Saves money and time with its very high stock removal rate on key materials. Pleasant working thanks to less vibration and noise. The ALLROUND cut TC burr range now includes a burr set. This contains five tungsten carbide burrs in the most common shapes and sizes for a variety of applications. The burrs are supplied in an unbreakable plastic box which protects the tools against dirt and damage. The box also has five extra slots to allow the user to add to the set as required. Burrs with ALLROUND cut can be used on flexible shaft drives and straight grinders, as well as on robots and machine tools. To ensure economical operation, PFERD recommends working with the burrs in the upper rotational speed/cutting speed range. Use the PFERD rotational speed calculator for example to work out the ideal speed. Find out more about the TC burr product range now. Click here to go to TC burrs for high-performance applications.